When witnesses are called before the Senate Judiciary Committee to discuss Supreme Court nominee Elena Kagan this week, the minority party will deploy a heavy military offensive against her: Republican senators plan to call three former officers who will likely testify that Kagan is a pro-gay, anti-troops, anti-American extremist who barred military recruiters from campus when she was the dean of Harvard Law School. All lean, clean-cut, and articulate, the three men look to be part of America’s best and brightest. But these witnesses aren’t typical rank-and-file soldiers: They’re paid professional conservative activists. Senior among the three men is Tom Moe, a retired colonel and Vietnam POW who campaigned for John McCain in 2008. While on the campaign trail, Moe, told a Pennsylvania audience that Barack Obama’s “demagoguery” was so dangerous, it could bring about a Holocaust if he was elected. He also defended McCain’s vote against wider GI Bill benefits for service members, arguing that greater educational and economic enticements for joining a war-wearied military were “unfair” to lifelong soldiers. Moe currently directs veterans programs for Republicans in the swing state of Ohio, apparently spending much of his time endorsing GOP candidates for office. 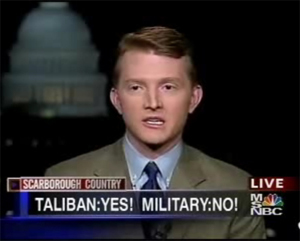 Flagg Youngblood: The young conservative criticizes his alma mater, Yale, on MSNBC for axing ROTC. / Courtesy of Young America’s FoundationThere’s also Flagg Youngblood, a Yale grad who has complained on the talk-show circuit about the unjust hardship of attending ROTC drills on another college campus, 70 miles away, when Yale shuttered its military cadre over the service’s “Don’t Ask, Don’t Tell” policy barring gays and lesbians from serving openly. (What Youngblood has failed to mention, though, is that his university provides free transportation to the military evolutions, and his ROTC scholarship subsidized 100 percent of his Ivy League education.) He now works full-time as a military outreach coordinator for the conservative Young America’s Foundation (YAF), whose treasurer is a former RNC deputy chairman and a key player in the creation of Swift Boat Veterans for Truth. I believe, if done correctly, eliminating Saddam and liberating Iraq could be the ‘Normandy Invasion’ or ‘fall of the Berlin Wall’ of our generation…the Iraqi people are eager to be rid of Saddam, and there is equally encouraging evidence that republican principles could thrive there. 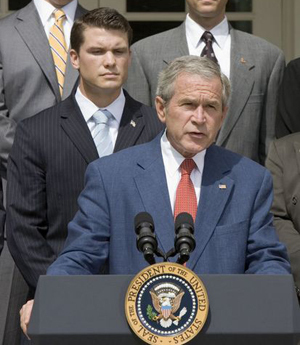 In 2008, Hegseth pulled down a $100,000 base salary as the head of Vets for Freedom. Tax filings from that election year also show his “nonpartisan” group has deep GOP ties, paying out hundreds of thousands of dollars to right-wing consultants, including one lobby group connected to former Republican senator Bill Frist, the Bush-Cheney campaigns, and Frank Donatelli, the treasurer of Youngblood’s YAF. I believe discrimination against gays and lesbians seeking to enter military service is wrong—both unwise and unjust…The military is a noble profession, which provides extraordinary service to each of us every day. But this simple fact heightens, rather than excuses, the iniquity in this case…I look forward to the time when all our students can pursue any career path they desire, including the path—as deeply honorable as any I can imagine—of devoting their professional lives to the defense of this country. Will any of those facts matter, though? In criticizing Kagan as anti-military this week, the Republican Party will sell itself, again, as the sole pro-military choice in Washington. That’s what the testimony of party-line proxies like Moe, Youngblood, and Hegseth is engineeered to convey. They’ve been rewarded richly by conservatives for their loyalty; it remains to see whether conservatives will be rewarded at the polls for their cynicism.